Barely seeming much thicker than a human hair, this 1mm 7×7 stainless steel wire rope still manages to offer up an incredible 7×7 strand configuration to provide superior strength and reliability. Sitting in our stainless steel rope range, it is a flexible and effective option. It may be a single millimetre in diameter, but this 7×7 stainless steel wire rope still has a safe load capacity, settled upon through rigorous testing. It can cope with up to 62kg before it exceeds its rated limit. With a breaking force of 0.61kN, it is easy to see why this type of cable can be useful for various practical purposes, from marine rigging to control cable deployment. This is not the only stainless steel rope of this strand configuration that we supply; diameters go right up to 12mm, at which point the SWL tops out at almost 9 tonnes. Stainless steel is a worthwhile choice of material if corrosion is likely to pose a threat to the integrity of the assembly you are creating. It is resistant to various environments and will not show signs of the usual wear and tear that can crop up on wire rope. You can ask Rope Services Direct to supply as much 7×7 stainless steel wire rope as you need, so call 01384 78004 or fill out our enquiry form online and let us take a load off your mind. Quick quotes and friendly advice are available to all customers. 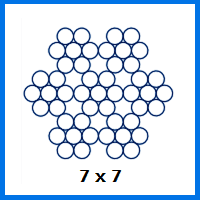 1mm 7x7 Stainless Steel Wire Rope Overall rating: 5 out of 5 based on 6 reviews.